Ah! I have been terrible about uploading my pictures here to my blog. I've gotten into the habit of doing my layout as the last thing before bed so by the time I get to uploading my pictures to the challenge I am beyond ready for bed. While I am still having fun, some nights I find that I feel like my inspiration and creativeness is running out. I also am missing a lot of sleep consistently and that's starting to not feel the greatest. BUT here I am 18 days in and have completed a layout every single day! Today's prompt was about jealousy. 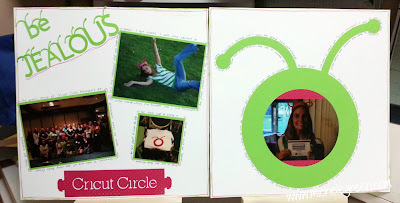 I really wasn't sure what to scrap here but then I rifled through my picture box and found these from when I won a Cricut Imagine at a Cricut Circle meet up. It was when they were first launched and you couldn't even buy them yet. It was a very exciting day!